All day long I was thinking about what to blog about and I just kept coming back to CANDY. So candy it is. Welcome to my random life. I'm in serious need of some sugar. Especially after looking online at all my favorite candies to get pictures. Ever since I can remember I've had a sweet tooth. I loved trick-or-treating and I would save my candy and make it last for months. We always have a bucket of candy in the house to munch on for dessert and gladly let our friends partake when they come over - we like to share the wealth if you will. Candy is a big part of my life. So what are my favorites you ask? Well. Lemme tell you. 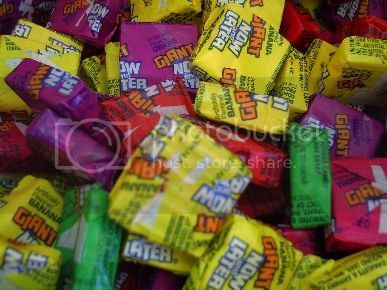 My all time most favorite candy in the entire world are Giant Now & Laters. They always have been my favorite and they always will be my favorite. They're pretty hard to come by on a day-to-day basis, though I know I could always stock up online. Usually I find them in random candy stores or in a select few grocery stores. I like all the flavors except for grape which I avoid like the plague. They're huge and fruity and chewy and that equals heaven. 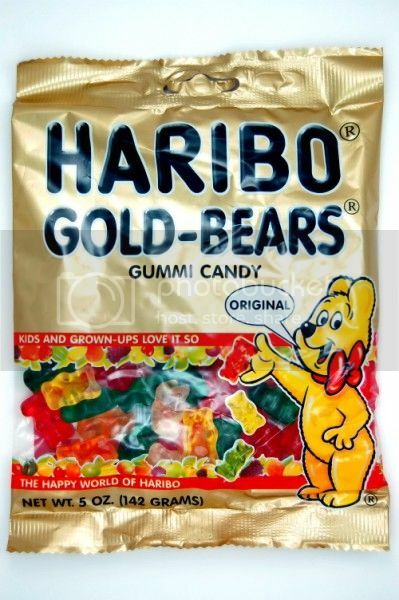 Another favorite of mine is Haribo gold bears. Or anything by Haribo really. My mom loves these too so I ate them frequently growing up. I like to either stick them in the fridge so they get cold and hard or open a bag and let them sit for a few weeks to get really hard. My taste buds are most fond of the red cherry, green apple, and white pineapple flavors. 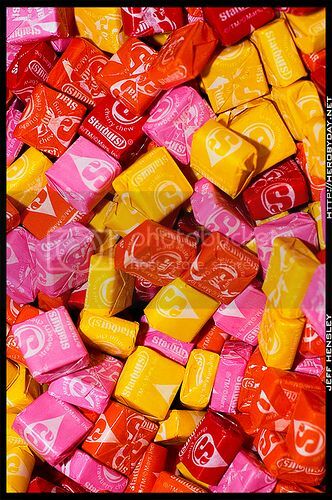 Starbursts are always a top pick of mine. They're a great size and the flavor is just so powerfully delicious. My favorite flavor is the cherry, then watermelon, then orange, then lemon. I do NOT like lemon flavored candy in any shape, way or form. I LOVE cherry candy in any shape, way, or form. There used to be a bunch of different kinds of starbursts and my favorites were the kind that came in blue packaging, then they went and changed a great thing so now I'm stuck with the classic flavors, which are still really good. 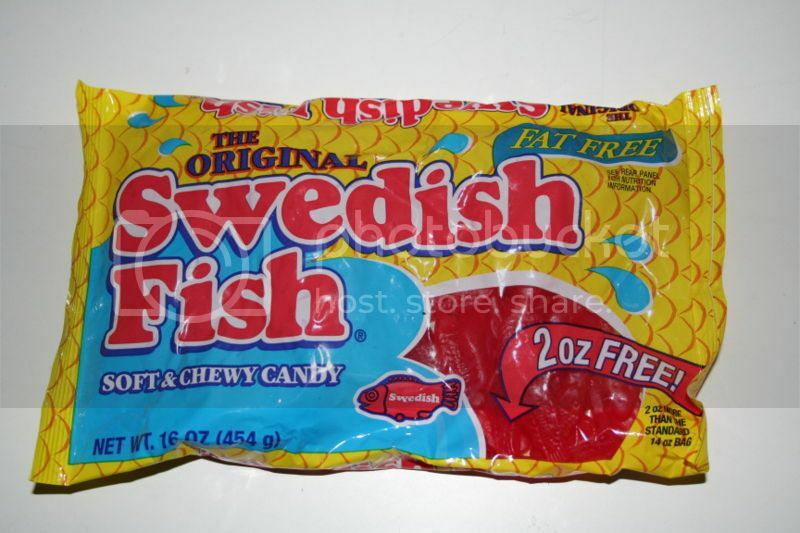 Are Swedish fish cherry flavored? Whatever they are, I love them. I could eat a whole bag of these and not feel bad. They're so good. 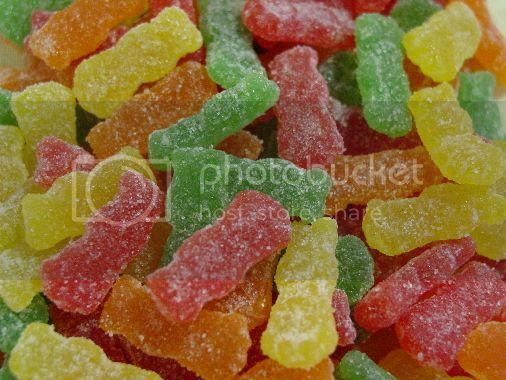 Another candy I really like are Sour Patch Kids. But really I only like the red ones so I pick those out first and give the rest away. I could live off of these things. "Two for me, none for you." So. Yeah. My mouth is pretty much watering now. I need some candy, STAT. haha, no it's cool. and yes i will go to a twilight/new moon/eclipse showing with you! that would be so amazing! and if they don't offer one, then let's put one on! Girl... I was thinking half way through that my mouth was watering! I knew there was a reason I love you so much! :) I love candy... always have... always will and I am a chewy candy girl myself... however... tonight I have been craving some chocolate and there is none in sight! If I didn't have so much ironing to do... I would make a run to Kroger! omg Paige! they are ALL my favorite!!! geez.....we really have something in common! thanks for the love/hate torture you put me through! 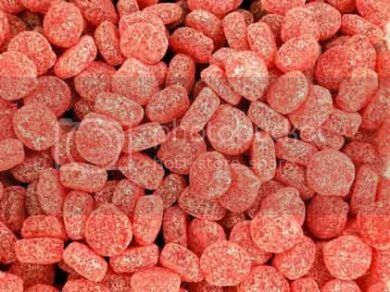 i've been craving sugar like crazy and we have much of the same tastes... fruity and chewy. but what i really was going to write was to tell you to put your milky ways in the freezer because honestly, the aren't even worth eating if they don't almost crack your teeth. but then i saw that you already do. SO glad to hear that! ps- cherry (or white or blue or any shade of red/pink) airheads sound good right now too. they take me back to my brother's little league games! and an icee would be nice. okay, i'll stop now. My FAVORITES the are Haribo gummi bears too! I stack a red, green and white and eat them together, but I like them fresh out of the bag--no stale gummis for me! i'm in france and the only candy of these that i can buy is the haribo! I might just have to go eat one for lunch:) Have a great day! that is exactly how i felt yesterday! I went to Home Depot today to get some spray paint, and EVERY time I go there, and I see the candy (mainly tempted there by Reese's and Sour Patch Watermelons), I WANT some. I feel like I NEED some. LOL. But I was like, "No, Reyanna! You do NOT need candy! You have some at home. Eat that first... then you can buy more." And NOW I read your post, and I'm kicking myself for not getting the sour watermelons! I LOVE those! GAH! LOVE candy! I love it! The Sweet Factory is all over the malls and such out there. My favorite is the chocolate covered gummi bears. But I've never heard of putting stuff in the freezer, quite interesting! I might have to try that. 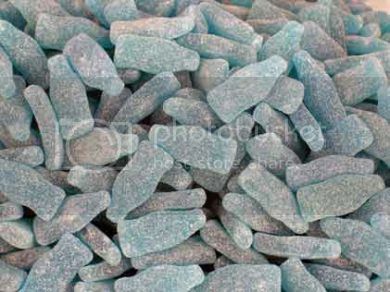 oh my goodness, those blue sour bottles are the most delicious candy out there, i love them!! 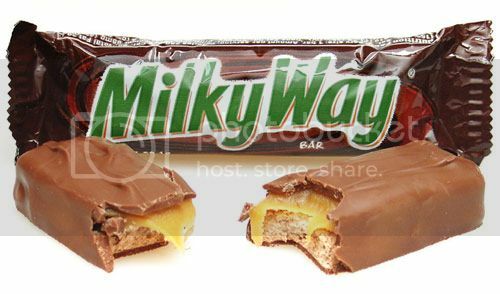 Milky Way....my favorite candy bar, but I love the dark chocolate one. I love me some dark chocolate. LOVE you blog. You and your hubby are absolutely darling! I'll keep coming back to keep updated!